President Obama speaks during a press conference following a meeting of the Association of Southeast Asian Nations - ASEAN - on Tuesday in Rancho Mirage, Calif.
President Obama said today, despite Republican vows to block him, he will nominate a successor to Justice Antonin Scalia, who died suddenly on Saturday. 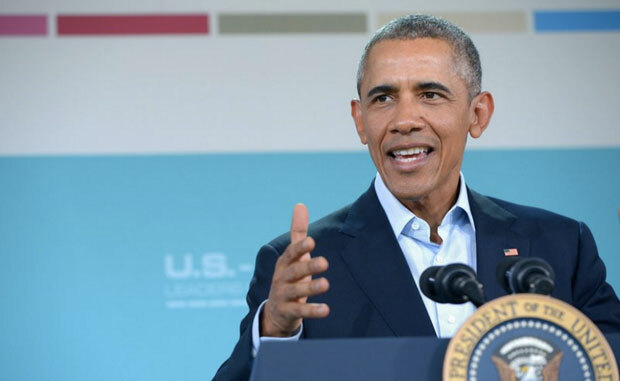 Obama spoke during a press conference after a summit with leaders from the Association of Southeast Asian Nations in Ranco Mirage, Calif., but the first questions from reporters were about filling the empty Supreme Court seat. Obama offered his condolences to the Scalia family and called the judge a "giant" on the Court before saying he intended to "do his job" as president and nominate a replacement. "The Constitution is pretty clear about what is supposed happen. When there is a vacancy on the Supreme Court, the president is supposed to nominate someone, the Senate is to consider than nomination and either they disagree or that nominee is elevated to the Supreme Court," he said. "Historically, this has not been viewed as a question." Obama characterized the rhetoric from Republicans — Senate Majority Leader Mitch McConnell called for the next president to nominate the replacement and others have said they would refuse to hold a hearing to consider any Obama nomination — as "a measure of how, unfortunately, the venom and rancor in Washington has prevented us from getting basic work done." He said, "This would be a good moment for us to rise above that."